In September 2010, TWC recieved funds to develop a community project in Somers Town, Camden. Working in conjuction with South Camden Community School, the My Space, My Place Project was born. 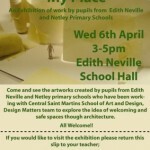 Children from Edith Neville Primary School and Netley Primary School have worked with students from Central St Martins School of Art and Design to explore ideas of welcoming and safe spaces though architecture.